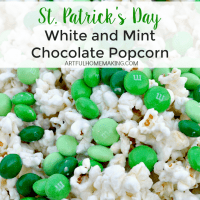 This St. Patrick’s Day chocolate popcorn recipe is so simple and great for a party or get-together! We haven’t always put much effort into St. Patrick’s Day, but since we do have quite a bit of Irish in our background, we decided to celebrate it this year. After reading several books about the real Patrick in our homeschool studies, we were inspired, especially by this one! We usually save this type of treat for a special family night or a family party. It’s not healthy, but it’s super easy to make and it tastes great! We almost always use an air popper to make our popcorn. We get our popcorn in bulk from our Azure Standard food co-op, and pop it ourselves on the stovetop or in our air popper. Melt the white chocolate/almond bark, either on the stove or in the microwave. We just put ours in the microwave this time. 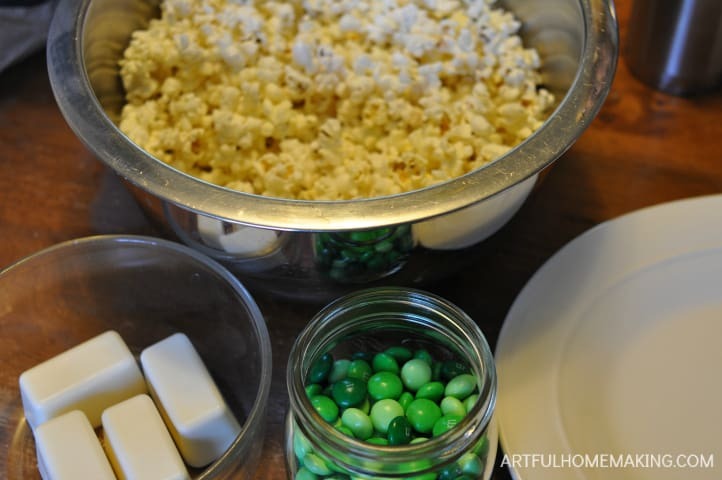 Pour the popcorn into a bowl or onto a serving tray. 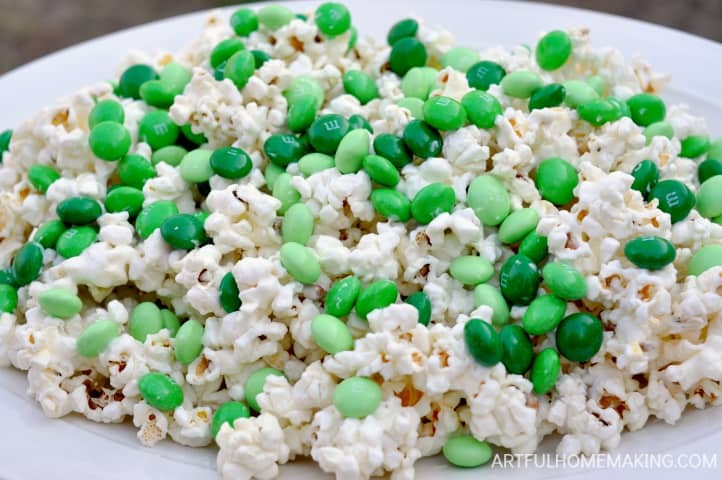 Make sure to remove any unpopped kernels. 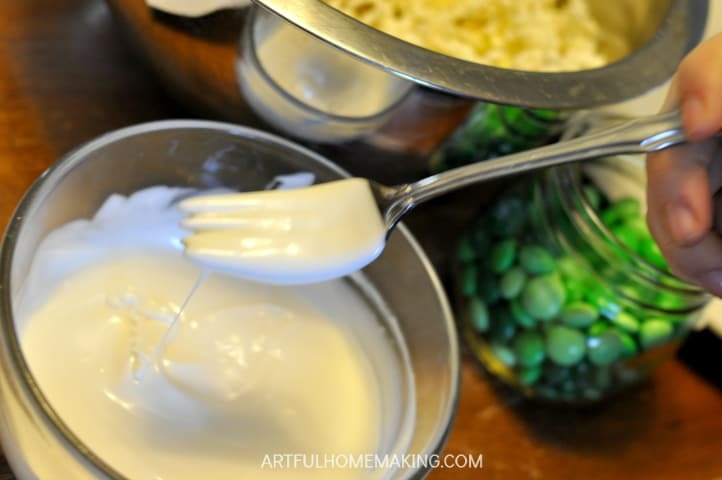 Drizzle the melted white chocolate over the popcorn and gently toss to coat. Add as many M&Ms as you want! 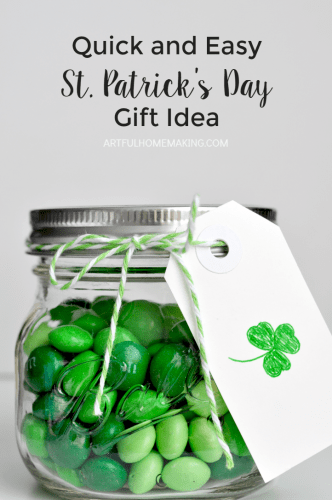 This is a fun and easy recipe for kids to help make! This made what I would consider about 6 servings, but if you needed to make more, it would be easy to double or triple the recipe. This looks so festive and fun! Such a cute idea. Your post was one of my features at Best of the Weekend this week. Thanks for joining us! Thanks so much for the feature, Shelley! This looks yummy! What a great idea! Saw this on Bloggers Pit Stop! I will definitely be making this. Thinking pink or blue for a baby shower? Where did you get the all green M&Ms? Pink or blue for a baby shower is a great idea! I think I found the all green ones at Walmart, or you can find them here. This looks SO good, I honestly want to make some right now…it’s 8:00am so that might be a bad idea. Thanks for the recipe!! 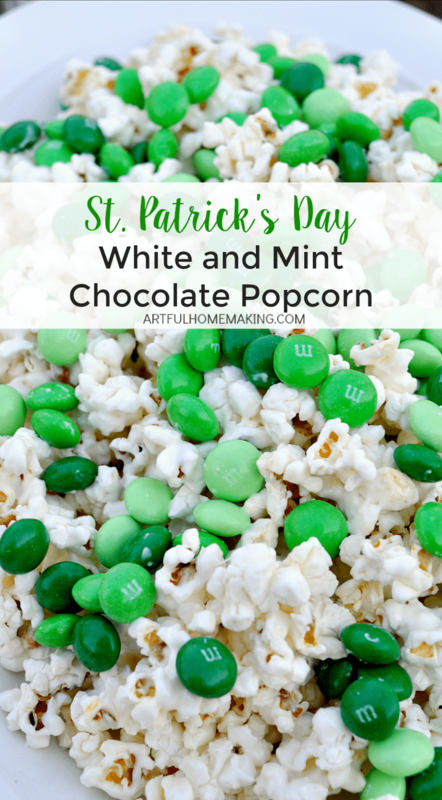 What a fun, and delicious, St Patrick’s Day treat! Thank you for sharing it with us at Hearth and Soul. Sharing on our Hearth and Soul Facebook page tomorrow. Thank you, and thanks for sharing, April!